Please consider nominating an outstanding educator for the Mari Muri Award, to be presented at our Fall Conference on December 3rd. Award criteria and nomination instructions can be found here. We are all gearing up for a fantastic conference on December 3rd in Cromwell, CT! Register now to join us. The Connecticut State Department of Education is requesting public input/comments regarding amendment to Principle 3 of the ESEA Flexibility Waiver. Feedack needs to be given on topics such as the use of test scores on teacher evaluation, how to determine growth in non-tested areas, and the implementation of the teacher evaluation system. It is imperative that our voice is heard; you have until September 20 to give your input. A conference call will be held on Monday, September 16, at 8:30 a.m. Details and more information can be found here. Do you or one of your colleagues have a classroom-ready, CCSS-aligned lesson to share? If so, please submit an application to be a presenter at the ATOMIC conference on December 3, in Cromwell. We need you to help make this a conference by teachers, for teachers! Achieve has produced a series of "Mathematics at Work" brochures to examine how higher-level mathematics is used in today's workplaces. The brochures present case studies drawn from leading industries nationwide to illustrate the advanced mathematics knowledge and skills embedded in jobs that offer opportunities for advancement and are accessible to high school graduates. The series underscores that all high school graduates - regardless of whether they enroll in college, join the workforce or enter the military - benefit from acquiring a comprehensive knowledge base and skill set in mathematics. We cordially invite you to join us September 27 – 29, 2013, for the Fourth International Realistic Mathematics Education Conference (RME4), a biennial conference held at the University of Colorado at Boulder in the foothills of the Rocky Mountains. This three-day conference is sponsored by the Freudenthal Institute for Science and Mathematics Education, the CU-Boulder School of Education and the Freudenthal Institute US. Since 2005, the RME conference has focused on strictly mathematics as the sole content area of interest. However, this year the RME conference includes studies in mathematics and/or science education, to promote productive intra- and inter-disciplinary discussions about ways in which contexts and representations promote student reasoning. Who Should Attend? The program is organized to address the needs of university faculty; district, state or national school administrators; and professional developers and teachers who are engaged in design and research in mathematics and science education and/or teach pre-service courses. The content addressed in this 3-day conference includes upper elementary through university level mathematics and science. The 2013 conference will focus on the use of contexts and representations in science, technology and mathematics in ways that support mathematical and/or scientific reasoning. Plenary and interactive breakout sessions will include presentations focusing on the use of context and representations in instructional sequences that are either specific to mathematics or science, or involve the integration of STEM content. The purpose of this approach is to offer comparisons of design research and related empirical studies within and across disciplines, to encourage cross-disciplinary interaction in design research in mathematics, science and technology, to further understand productive similarities and differences in design research and the application of activities and instructional sequences that promote reasoning, modeling and problem solving in natural science, life science, and mathematics. The program will include keynote speakers Paul Cobb, Harrie Eijkelhof, and Alex Repenning, and an expanded program of 90 minute breakout sessions offered by researchers, educators, and curriculum designers from the Cayman Islands, Japan, the Netherlands, South Africa, United Kingdom and the United States who have engaged in research, design and use of instructional sequences to support understanding of math, science, and integrated domains from primary, secondary and undergraduate level education. Several plenary/keynote sessions have been scheduled for the 3-day conference. Paul Cobb (Vanderbilt University, USA), Harrie Eijkelhof (Director, Freudenthal Institute for Science and Mathematics Education, NL), Alex Repenning (University of Colorado Boulder) and other plenary speakers will highlight different perspectives on the use of context, representations, and other RME-related design principles in curriculum, assessment, instruction, and teacher learning. Their presentations will further describe how materials and activities have been designed to promote student understanding of mathematics and science. The conference program will also include seven 90-minute breakout sessions organized by thematic strands and grade bands. The themes are instructional design, professional development and student learning with grade bands addressing primary, secondary and post-secondary levels. Most of these sessions will be conducted in an interactive, workshop style to promote engagement with math and science activities, to support analysis of student responses, to reflect on classroom video excepts, and to explore the use of various technologies. Many of the resources shared in these sessions can be used for further development of resources, professional development, or classroom activities. This conference will also include sessions that are related to Realistic Math Education but are not necessarily direct derivatives, to further articulate the relationships between various approaches and provoke deliberation and discussion of productive approaches that support student learning. The use of contexts, models and tools will be shared and discussed in light of this goal. The ways in which research on student learning, productive instructional sequences, and assessment practices are aligned with such approaches will be used to inform future research and design in topics beyond the scope of this conference. In addition to a mix of plenary and breakout sessions, ample time for discussion between sessions for informal meetings and professional networking has been planned into the schedule. Saturday afternoon will offer an opportunity for local tours of downtown Boulder and early evening hikes in the foothills of the Rockies. As a courtesy for participants who preferred to wait until more program information was available, we have extended the pre-enrollment deadline to July 19th. Please register by the July 19th pre-enrollment deadline for a reduced conference fee of $295. After July 19th the standard registration fee is $365. The Knowles Science Teaching Foundation (KSTF) supports passionate, dedicated teachers to thrive in the profession, lead from the classroom and become change agents in education. The KSTF five-year fellowship is now accepting applications until October 15, 2013. Below is an overview of our teaching fellowship and eligibility requirements. Please share this information with future and beginning high school science, technology, engineering, and math (STEM) teachers in your network. For more information on our teaching fellowship, review our recruitment flyer or visit www.kstf.org/apply. Thank you in advance for helping us to spread the word. The KSTF five-year fellowship, one of the most generous and comprehensive professional development programs for STEM teachers, provides its fellows access to a close, collaborative community of like-minded colleagues. 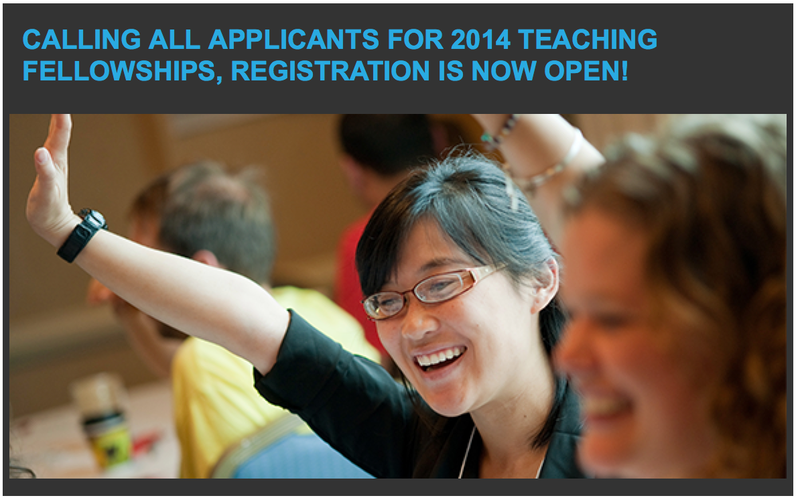 KSTF Teaching Fellowships are awarded annually in the areas of STEM education. In selecting fellows, KSTF asseses depth and breadth of the applicant's content knowledge, their potential to develop exemplary teaching practices and their ability to cultivate their leadership skills to become teacher leaders. The Knowles Science Teaching Foundation (KSTF) was established by Janet H. and C. Harry Knowles in 1999 to increase the number of high quality high school science and mathematics teachers and ultimately, improve math and science education in the United States. KSTF operates three programs that build national capacity for improving science, technology, engineering and mathematics (STEM) teaching, leading, and learning: Teaching Fellowships, Research and Evaluation, and Senior Fellows.